What better way to unwind at the end of the day than with your very own spa? Maybe having an entire spa in your home is too much to ask for, but having a luxurious bathroom that feels like a spa certainly isn’t out of reach. When you choose to work with Plush Designs, a deluxe bathroom remodel is just a design away. Whether you simply want to upgrade your guest and family bathrooms or you are looking for a major master bath renovation, our designers can make your space feel completely transformed. We’ve done countless bathroom remodeling designs in Colorado Springs, CO, so our designers know how to make the most out of your space. It’s amazing how much your bathroom can change with a simple redesign. What used to look outdated and feel grimy will transform into a tranquil and clean space that you actually want to spend time in. 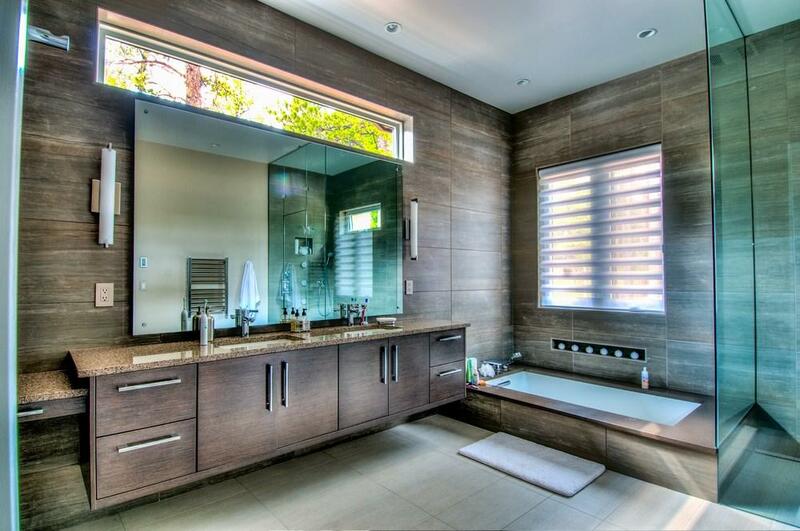 With changes to both fixtures and appliances, you will have a beautifully designed luxury bathroom. You keep a lot stuff in your bathroom: beauty products, linens, cleaning supplies and more. To keep your bathroom looking organized and clean, cabinets and vanities are a must. Of course, you want your storage space to look as beautiful as the rest of your bathroom, which is why Plush Designs carries top-of-the-line cabinetry. You won’t find better custom cabinetry in Colorado Springs! Now that you have the cabinets and vanities to store your bathroom essentials in, your countertops will be clear of all clutter. Therefore, you’re going to want the highest quality countertops to give your bathroom the extravagant appearance you’ve only dreamt about. Our designers will help you find the right material and color to match the rest of your newly remodeled bathroom. Finally, a bathroom isn’t truly updated without high-end appliances to complete it. From spa-worthy bathtubs to soothing rainfall showerheads, new luxury appliances are an absolute must in a bathroom remodeling project. Plush Designs exclusively carries the best names in home appliances, giving your space the perfect finishing touch. After you’ve approved your stunning bathroom remodeling design, it’s time for the renovation work to start. At Plush Designs, our job is to provide you with a design for your newly remodeled bathroom, but we can also help you find the right contractor to do the renovation work for you. Over the years, we’ve built longstanding relationships with top bathroom remodeling contractors in the area, so you know you’re working with the very best at every step of the process. On the other hand, if you already have a contractor in mind that you’d like to work with, we are just as happy to coordinate with them. Our goal is simply to design your new bathroom and make sure your dream space comes to life with the help of the absolute best remodeling contractors around. Want to see what opportunities await for your home in Colorado Springs with a bathroom remodeling design project? Call Plush Designs Kitchen and Bath today to schedule an appointment with our team of bathroom designers. We're happy with the RD Henry cabinet quality and the caliber of customer service and installation labor supplied by Plush Cabinets.